Waldo Goronwy Williams was born on 30 September 1904, in the town of Haverfordwest, Pembrokeshire in West Wales. Waldo was the third born of five children including three sisters, Morvydd, Mary and Dilys and a brother, Roger. Their father, John Edwal was headmaster of Prendergast School. Before his appointment in 1900 he had taught in England for around 15 years, mostly in Sheffield where he became influenced by the radical ideas of Edward Carpenter, one of the early socialists. But he was a native of Llandysilio in Pembrokeshire. Waldo’s mother, Angharad was raised at Market Drayton in Shropshire. Her parents were Welsh. Her father was a native of Llangernyw near Denbigh. He was the brother of the philosopher Sir Henry Jones. Angharad’s mother was from Ammanford in the industrial south and was a relative of the poet and teacher, Watcyn Wyn. John Edwal and Angharad spoke to their children in English although they were both Welsh-speaking. English was the language spoken by the majority of the population of Haverfordwest. The education system at the time stressed the importance of English; Welsh was not even part of the curriculum in Anglicised Haverfordwest. 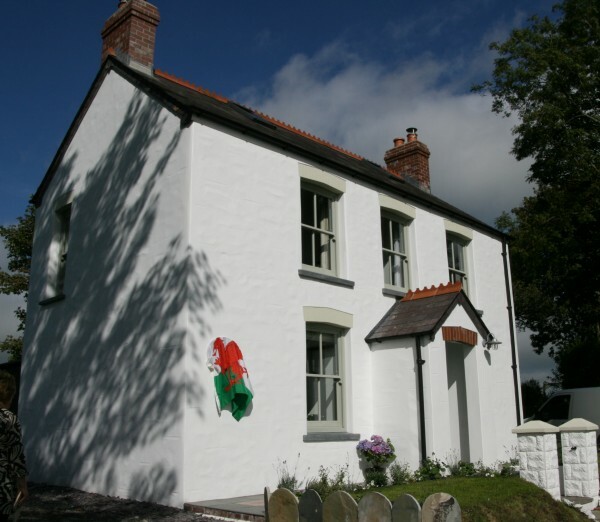 Because of the father’s nervous disposition the family moved to Mynachlog-ddu in the heart of the Preseli in 1911 where he took control of a less demanding rural school. All the inhabitants spoke Welsh and hence Waldo learnt the language as he played with his newfound friends. From then on he would express his deepest innermost feelings through the medium of Welsh. He never composed any poems of note in English apart from humorous or slightly satirical compositions. He saw the Welsh language as the lustrous pearl of infinity. 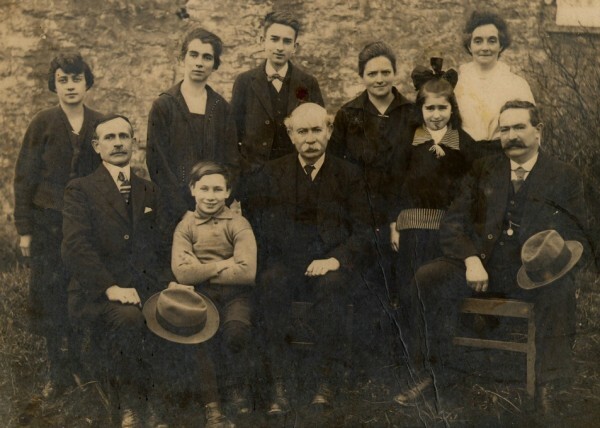 In 1915 John Edwal was appointed headmaster of Brynconin School in his family’s heartland. It was at Llandysilio that Waldo grew to be a man. But within three weeks of moving he experienced the first major tragedy of his life when his elder sister, Morvydd died suddenly. The two would spend much time in each other’s company writing poetry. Waldo spent the next few months, coming to terms with his grief, at the home of his grandmother and grandfather in Bangor. He attended Narberth County School where he excelled in almost every subject. He took an active part in the activities of Blaenconin Baptist Chapel under the ministry of the Rev. D. J. Michael. Between 1923 and 1927 he studied English at the University College of Wales, Aberystwyth, followed a teachers training course and formed a close friendship with the dramatist, Idwal Jones who was renowned for his sense of humour and mischief. Waldo was prominent within the social life of the college and edited The Dragon, the student magazine. He returned to Pembrokeshire in 1928 and for the next twelve years he was primarily a supply teacher in schools across the county. He was a regular eisteddfod competitor along with his two literary friends, W. R. Evans (Wil Glynsaithmaen) and E. Llwyd Williams (Ernie Lan). The three-some were often referred to as ‘the three legs of the tripod’. He would also spend his time in deep meditation and heightened his belief in pacifism. Waldo was a familiar sight on the county roads as he cycled everywhere. He did not own a car. 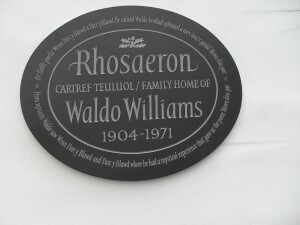 Soon after he wed Linda Llewelyn, from Mardy in the Rhondda, a cousin to his own cousin, Gwladys Llewelyn, who kept the old family home, Rhosaeron, in Llandysilio, Waldo decided to leave his temporary post as headmaster of Puncheston School. He had recently registered as a conscientious objector, even though he was too old to be called up to fight in the Second World War, and as he therefore suspected he would be sacked he left and moved to the Lleyn Peninsula in Caernarvonshire. It was there, in 1943, he experienced the second major tragedy in his life when his wife, Linda died of T.B. Waldo left Botwnnog School at Pwllheli and spent most of the following five years teaching in England, at Kimbolton, not far from Cambridge, and Lyneham, near Swindon, before returning to teach in Breconshire for a short while and then back to Pembrokeshire by 1951. By then he had made the decision not to pay income tax in protest against war and military conscription. To avoid income tax being taken from his salary, as happened when he was a teacher, he took up a post as a lecturer with the Extra Mural Department, UCW, Aberystwyth. He was now receiving direct untaxed payments and this arrangement continued for ten years until 1963. During this period Waldo led an almost nomadic life living in lodgings all over the county and occasionally renting rooms as he did at Great Harmeston between Haverfordwest and Milford Haven. That is where bailiffs called to take his possessions in lieu of his debts to the Inland Revenue. It was around this time that he joined the Quakers at Milford Haven at the invitation of his friend, Steffan Griffith. Rhosaeron family, seated from the left: Gwilamus Williams, Waldo’s uncle; Roger, Waldo’s brother; John Edwal, his father; Levi, Waldo’s uncle. Standing, from the left; Mary, Waldo’s sister; Gwladys Llewelyn, Waldo’s cousin; Waldo; Angharad, his mother; Dilys, Waldo’s sister and Elizabeth, Levi’s wife. His single volume of poetry Dail Pren (Tree Leaves) was published in 1956 although he had jointly published a volume of children’s poetry with E. Llwyd Williams twenty years earlier. It was only with a great deal of persuasion that the volume was published as he initially refused to give his blessing to a collection of poems, already in proof form, that had been gathered together unbeknown to him by some of his friends. Waldo insisted he required time to compose more poems and then present the volume as a means of salvation for the Welsh nation. He was twice jailed in the early 1960s for refusing to pay income tax. Although conscription had ceased by his second incarceration he refused to pay a single penny until every soldier, including one of his nephews, had completed their term of military service and been released. It was then that he took up teaching again and taught Welsh as a second language in primary schools including Catholic schools. Although he bought a house in Haverfordwest he never took up residence because he was taken ill in January 1970 when his speech was severely affected. He died in May the following year, four months before his 67th birthday on Ascension Day, the day Jesus Christ is said to have ascended to heaven.